First up, prepare your vegetables. Finely slice the soaked, dehydrated shiitake and your choice of medley of mushrooms so that they are all of similar size, and then place all together in a bowl. (Hint: you can use any mushrooms you have to hand alongside the soaked shiitake. We like a combination of fresh shiitake, oyster and shimeji, but you can use any that are available to you!). Next, finely matchstick your carrot as well as finely slicing the sugar snaps and trimming and washing the beansprouts. Peel both the garlic and ginger, before finely dicing the garlic and matchsticking the ginger. Finally, chop your spring onions into large chunks, about 3cm long, and remove the roots. Time to build your wok clock! 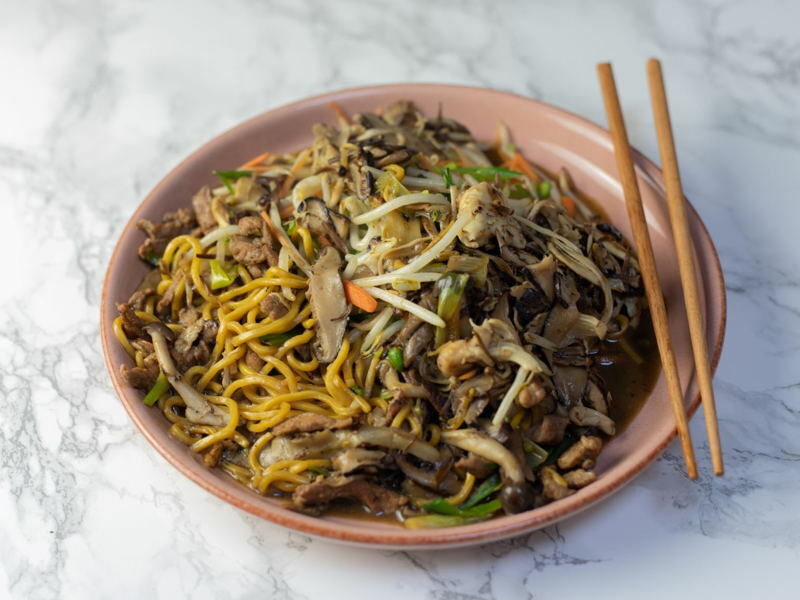 On a large plate, place your bowl of mushrooms at 12 o’clock, and then arrange the sliced carrot, sugar snaps, beansprouts, garlic, ginger and spring onion clockwise around the rest of your plate. Leave to one side. Now, move onto your pork. Removing the large fatty sections, slice your pork into small, thin strips and place into a large bowl. Pour ‘The Marinade’ ingredients over the top of the meat and massage the liquid thoroughly into the meat. Leave the bowl to one side. Lastly, make up your sauce. In a small bowl, combine ‘The Sauce’ ingredients and leave to the side. Remove your fresh egg noodles from their packet and lightly toss in oil, then also leave on a separate plate. You’re ready to wok! Bring your wok to a high heat and add a small amount of vegetable oil, swirling the oil around the pan until it reaches smoking point. Pour in the bowl of mushrooms, pushing in with the back of your ladle to allow them to sear, before folding them through. Repeat the process of searing and folding for approximately 3 minutes, until the mushrooms are cooked but slightly charred. Stir in a pinch of salt and then transfer to a large bowl to one side. Bring another teaspoon of oil to its smoking point over a high heat, then add your harder vegetables of carrots and sugar snap peas. Stir fry for just 1 minute before pushing them to the side of the wok and adding the bean sprouts into the gap. Allow the beansprouts to sit and sear for a few seconds before folding them through the vegetable mixture and stir frying for a further minute. Remove the contents of the wok into the same bowl as the mushrooms and leave to the side. Return your empty wok to a high heat, and once again bring a drizzle of oil to its smoking point. Add the slices of pork, pushing into the meat with the back of your ladle to sear before stir frying until the meat is cooked. Now, push your meat to the side of the wok, adding the garlic, ginger and spring onion into the gap along with another drizzle of oil if your wok is dry. Bring the pork over the top of the vegetables, and allow the mixture to sear for 20-30 seconds. With the wok still smoking hot, pour in your sauce and bring it to the boil. Add your cornflour paste one teaspoon at a time, adjusting until your sauce reaches a silky consistency. Finally add your noodles, moving them so they are all well-coated in sauce, before placing your pre-cooked vegetables back over the top. Leave for approximately 2 minutes, ensuring that the noodles do not catch or burn, and then serve. Enjoy!